Grate the rind of one lemon and set aside. Beat 8 egg yolks in a bowl to break them up, then pour the yolks through a sieve into a heavy-bottomed pot to strain out the white membranes. Stir in 1 ¼ cups sugar and ¾ cups lemon juice (3-4 lemons) and cook over medium heat, stirring constantly with a wooden spoon in a figure-eight motion. Continue cooking until the curd thickens enough to coat the back of the spoon. Lift the spoon out of the curd and run your finger down the length of the spoon. If your finger leaves a line, the curd is thick enough. If the curd runs and covers up the line, it’s too runny and needs to cook longer. Remove the pan from the heat and add 10 tablespoons of unsalted butter and the lemon zest. Stir until the butter is completely melted. Pour the curd into a small bowl, and let cool to room temperature. Then, cover the cooled curd, and refrigerate until you’re ready to use. 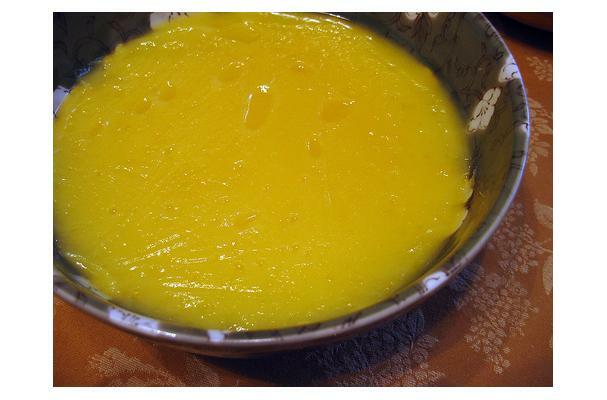 Lemon curd will last in the refrigerator for up to 2 weeks. I have a recipe from Baking by Dorrie Greenspan that calls for the zest of 3 lemons that is mixed in with the sugar before it's added to the eggs. It also uses whole eggs. The curd is strained before the butter is added to remove the zest. I made it recently and it turned out perfectly and was very lemony.